How can printers keep getting better? Over the past ten years, improvements have mostly been focused on connectivity. 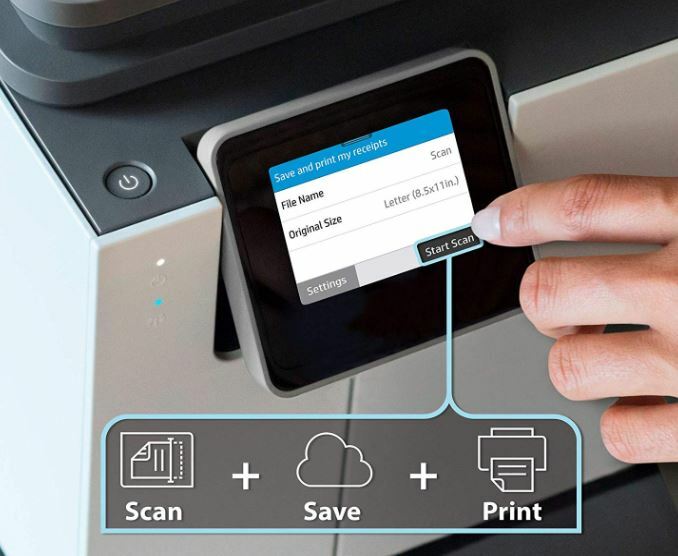 These days, you can easily find a printer that connects through Bluetooth, Wi-Fi, or into the cloud. But for the next few years, the big improvements coming to printers will mostly have to do with automation. You can get a sense for that by looking at some of the printers that have come out over the past 18-months. 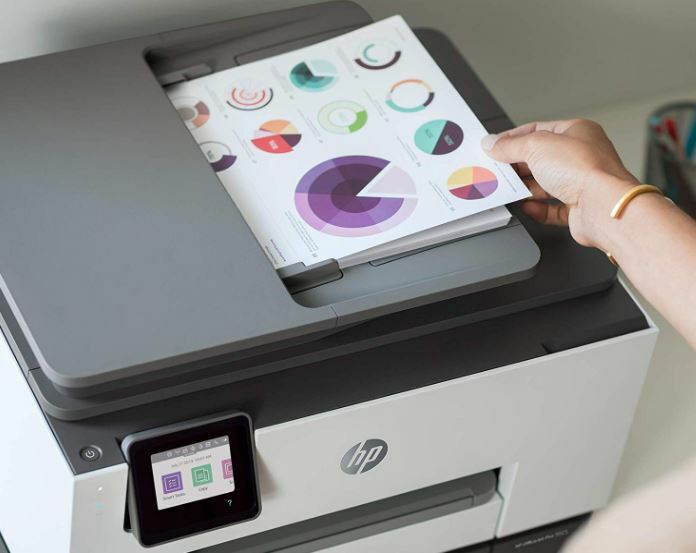 HP’s latest generation of printers in particular have been heavily focused on improving things like automating document scanning. Of course, HP printers are advancing in other areas as well. More often than not, their design is a little bit smarter with each generation, and their performance improves slightly as well. But it’s really the automating tasks that will be able to save people lots of time as those features continue to roll out over the next few years. As its name suggests, the HP OfficeJet Pro 9025 All-in-One Wireless Printer is an all-in-one style device. That means it’s capable of printing, scanning, copying, and even faxing. But it’s also quite capable of helping you to automate a number of those tasks for a more efficient workload. Thanks to the 9025 being constructed around a pretty hefty 1.2GHz processor, you have more than enough processing power to undertake multitasking. The Pro 9025 series is mostly about speed, and keeping you working instead of waiting. 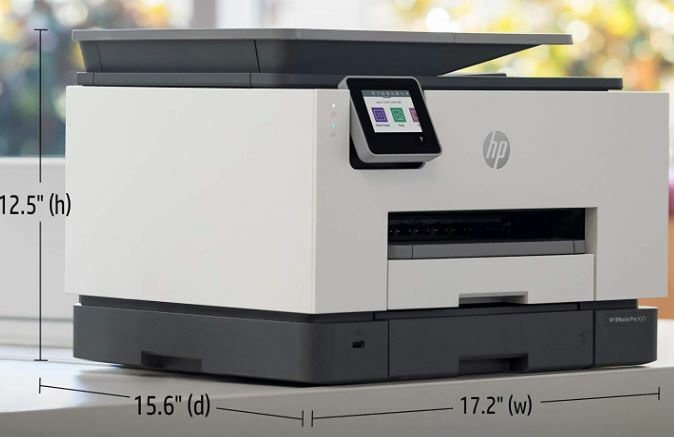 The new line of OfficeJet printers are roughly 40% smaller than HP’s previous line of Pro printers. When you’ve retracted the tray, the OfficeJet Pro 9025 measures 17.20 x 15.60 x 12.53 inches. That’s pretty compact, especially compared to similarly capable equipment. Keep in mind, when you extend the tray, its depth moves from 15.6 inches to 21.5 inches. A slight advancement in size, but one that’s worth the tradeoff given the capacity of the tray. The OfficeJet Pro 9025 is actually quite hefty, weighing about 26lbs. Even though they’ve made these printers considerably smaller than they used to be, there’s still quite a bit packed inside. After you’ve put a couple reams of paper in this printer, the total weight could easily reach 46lbs. That’s too heavy for some of the weaker printer stands on the market, but with a sturdier placement, the extra weight should only help add stability to the unit. In terms of appearances, this machine certainly has HP’s distinctive style. The basalt gray and white interface looks highly professional and certainly a bit modern. The most aesthetically pleasant portion of the front interface is the display, which is actually a touchscreen. The 2.65” screen is also a full color display complete with visual graphics to help you navigate through the interface. Pretty smart looking stuff, and infinitely more usable than printers from only a few generations ago. The monthly duty cycle for the OfficeJet Pro 9025 is 30,000 pages. That works out to about 1,300 sheets per day for a Monday through Friday workweek. But the recommended throughput for this printer is closer to 2,000 pages per month. That’s more like 80 pages per day with a Monday through Friday workweek. Compared to its predecessor, the 9025 has pretty close to twice the total capacity. Even though this is a pretty small machine, this printer was made take on some higher volume jobs. Which is why this printer was constructed with two separate 250-sheet trays. In other words, the 9025 is capable of being loaded with two entire full reams of paper. HP was able to greatly increase the size of the paper tray because the Pro 9025 now makes use of a special smart tray to help prevent your pages from overflowing. Pretty handy for a high throughput environment. And that smart design is much of the reason why it’s worth extending the tray to begin with. Color prints are created with the help of HP’s Thermal Inkjet technology. Though it would be an exaggeration to say color prints are print-shop quality, inkjet prints do look pretty good these days. Color print quality reaches a maximum 4800 x 1200 DPI resolution. Black and white sheets have a slightly smaller resolution of 1205 x 1200 DPI. In terms of speed, the 9025 can churn out black and white sheets at a pretty astounding rate of 24ppm for ISO or 39ppm for a draft. The print speed for color sheets is almost identical, sitting at 20ppm. Notably, that’s about twice as fast as an entry-level color printer of similar quality. The document auto-feeder supplies a total of 35-pages. That’s basically enough for you to be able to drop a stack of documents on the printer and walk away while it works. But don’t walk too far. Compared to the 9010 series, the OfficeJet Pro 9025 can churn through the documents in that auto feeder about twice as fast. The copier can churn through 39 copies per minute. Pretty quick! The only real limitation to keep in mind is that the copier can only capture a resolution of 600dpi, and has a maximum single pass setting of 99 copies. So you can only place about 3-minutes worth of pages before the printer will be done with its tasks. With cloud-based printing and wireless solutions being so standardized, it shouldn’t surprise you to learn the OfficeJet Pro 9025 was built with both. That makes it pretty easy to maintain the freedom to work anywhere, quickly accessing and printing your documents as needed. You can even get high quality document scans sent straight to the cloud, or basically anywhere else on your network. The OfficeJet Pro 9025 has a number of business-facing features as well. If you’re looking for a bit more hands-on configuration, it’s possible to get notifications about your scanning, copying, or printing. It’s built up with some impressive security additions that can help protect customer data, and encryption options to ensure your files never leave your network. HP provides a network firewall and encryption support to help protect customer data. It’s worth noting that the non-print portions of this machine are about as formidable as the printing parts. For instance, the scanner was made with easy slide-off glass to help make the scanning experience as smooth as possible. Naturally, it supports duplex ADF scanning. And it’s possible to save your files in one of half a dozen common formats, including PDF, JPG, TXT, and others. Very convenient, very straightforward. If you use the fax machine, you’ll be pleased to note it has a memory of about 100 pages, and can transmit at about four pages per second. Not bad, though these numbers haven’t moved much over the past few years. Beyond that, there’s not much to note about the fax features. 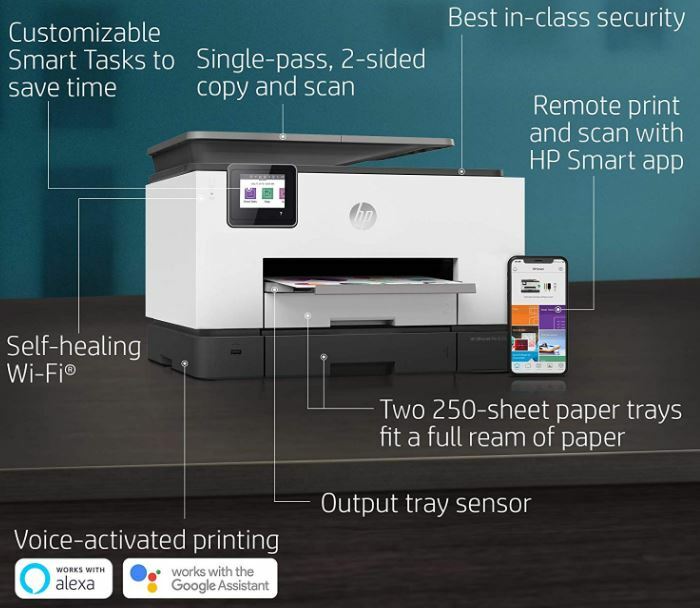 One of the advantages of getting your printer from a larger brand like HP is that you generally end up with strong app support. Making an effective app for some type of physical device is almost always pretty expensive, especially if you want to maintain and upgrade that app alongside your products. It’s often only bigger brands that can do it well. The HP Smart app mostly lives up to its name. It can help you automate a number of scanning tasks by helping you create your own user-guided shortcuts. These shortcuts are like teaching your printer to follow some repetitive steps. For example, you might create a shortcut that would rename a file, save it, back it up, email a copy, and then print it. From a single keystroke, you could perform all of those functions in one pass. It’s great for batching, and other repetitive office tasks. You can then name the shortcuts you create and sync them with cloud services like Dropbox and Google Drive, or software programs like Excel or QuickBooks. When you’re dealing with multi-step printing processes, it’s possible to start shaving some serious time off how long it takes to get things done. According to some of HP’s research, when performing some of these more complicated multi-step processes, automating the steps helps you get things done about twice as quickly. Since it’s their research, you might take that with a grain of salt. But in any case, you can certainly get some extra speed by having the right equipment for whatever tasks are at hand. The HP Smart app helps keep your smartphone in the loop, too. It uses a self-healing Wi-Fi that works to identify and rectify connection issues. That sounds a like a relatively minor thing, but it’s actually more than a time-saving feature. Once again, it’s a feature made with a heavy emphasis on the concerns of busy businesses. In the middle of a business day, you don’t want your printing equipment to cut out and experience some kind of network failure that requires someone’s attention. You don’t want to run over those speedbumps, especially when you expect them the least. And HP’s self-healing Wi-Fi network lets you identify and solve those issues before they become problems. The 9025 uses four print cartridges, magenta, cyan, yellow, and black. Replacement cartridges include almost any of the HP 962 series, including the 962XL series. Those cartridges are good for between 700 and 1,600 pages. You can also use the 966XL black cartridge capable of about 3,000 pages. 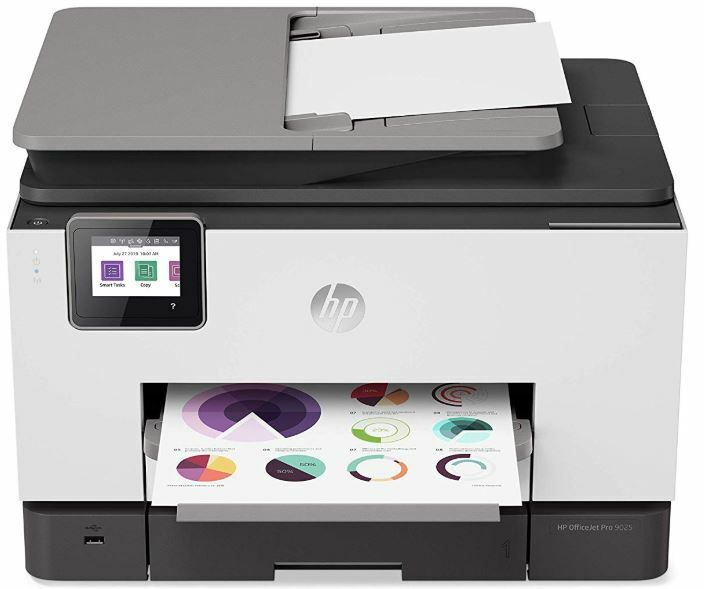 Additionally, these printers are compatible with the HP Instant Ink program. For people who go through a lot of ink, HP’s ink delivery program can help you save considerably. For connectivity, you’re looking at a single USB 2.0 port, a host USB port for printing images, an Ethernet port, a wireless 802.11 connection, and a pair of RJ-11 modem ports. 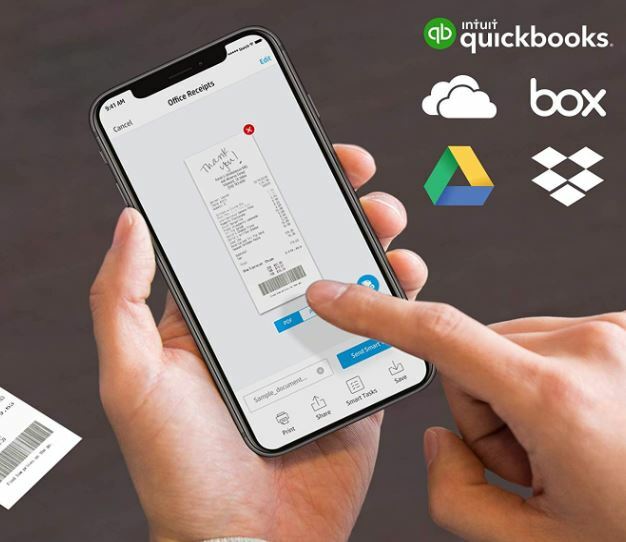 Through the internet connectivity options, you’ll find additional support for Apple AirPrint, Mopria, HP Smart, and Wi-Fi Direct Printing. This printer can accommodate wither Windows or Mac systems; through you’ll need an operating system that was made in the last decade. It includes the power cord, setup guide, and a one-year warranty. The 9025 series also include automatic firmware updates from HP. 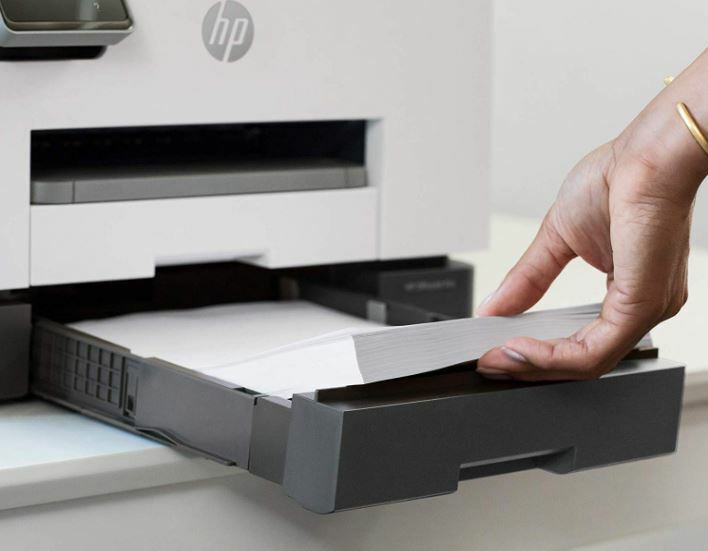 Who Should Choose the HP OfficeJet Pro 9025 All-in-One Wireless Printer? If there’s anything wrong with this machine, it’s the things that are missing from its feature set. For instance, there is no automatic paper sensor. However, if you’re not looking for missing features, there’s plenty of things to love about the OfficeJet Pro 9025. For one, its print capacity is equally as strong as its other all-in-one capabilities. This machine is highly effective for copying, scanning, faxing, or otherwise distributing documents across a network. 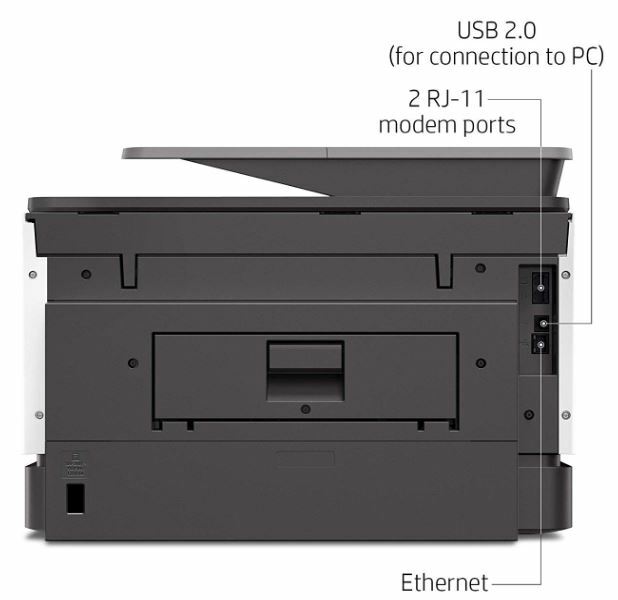 Its connectivity options are extensive, and its far more compact than a printer this powerful tends to be. And above all, it does the job quickly. 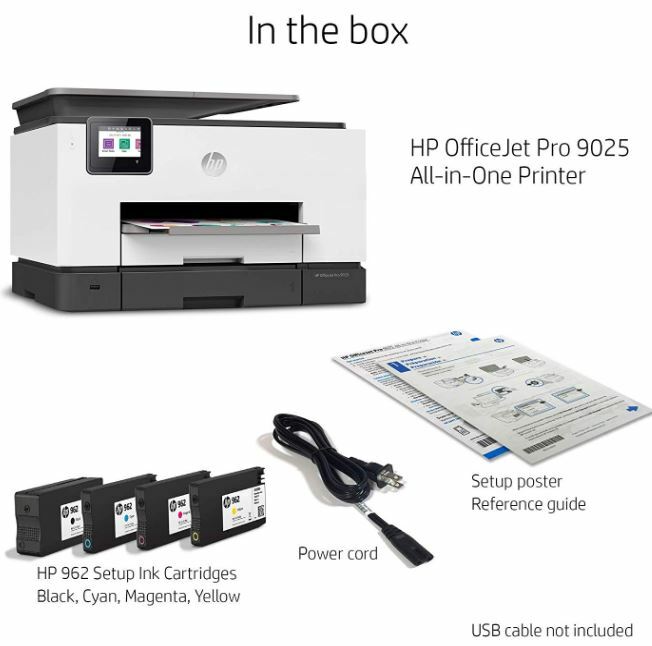 Which makes the HP OfficeJet Pro 9025 All-in-One Wireless Printer a good choice for someone in a higher throughput environment. It’s probably overkill for a two-person office that’s doing 11 pages per day. But short of breaking out some gigantic copy-shop sized equipment, the OfficeJet Pro 9025 is about as powerful as a compact all-in-one printer can be.